The conquests in 2014 by what used to be known as the Islamic State in Iraq and Syria (ISIS) and now just as the Islamic State, have dramatically shown that other dams in Iraq can also pose problems, if not on so catastrophic a scale. realized after closing the dam gates—which resulted in a rise in water levels behind the dam—that if the closure continued, they will be besieged twice, once by the armed forces, and the second by rising water, and if they had to withdraw, they would drown, which in turn forced them to reopen the floodgates. ISIS has two objectives: on the one hand, they want to drown the areas surrounding Fallujah, but the sudden attack by the [government] army foiled that plan; on the other hand, they want to cut off water supply to the central and southern governorates in order to give their war a sectarian dimension. The Fallujah Dam (or Barrage). The U.S. Embassy in Baghdad estimated that ISIS' actions in Fallujah caused a water shortage for hundreds of thousands of Iraqis. ISIS has also previously rendered water sources undrinkable. On April 17, gunmen detonated IEDs on a oil pipeline causing a massive spill which contaminated the western half of Baghdad's water supply. The ISIS militants advancing on the Euphrates River dam, about 120 miles northwest of Baghdad, were coming from the north, the northeast and the northwest. The fighters had already reached Burwana, on the eastern side of Haditha, and government forces were fighting to halt their advance, security officials said. ... "This will lead to the flooding of the town and villages and will harm you also," the employee said he told the officers. According to the employee, who asked not to be named because he was not authorized to speak to the news media, the officer replied, "Yes, I know, it will be against us and our enemies." (1) Mesopotamia, one of the most ancient areas of human civilization, has always been defined by its two great rivers, the Euphrates and the Tigris; how ironic that these life-giving sources could potentially also be the vehicle of the country's doom. (2) A look at dams and other structures that endanger their downstream populations helps put this threat in context: I review some cases at "Waterworks Catastrophes." July 21, 2014 update: Nadia Massih looks at how "ISIS gains highlight 'aggressive' use of water as weapon of war" in Beirut's Daily Star. She notes that ISIS now controls some key waterworks on the Euphrates and Tigris rivers and is trying to win control over others – rivers, dams and desalination plants. These are crucial to its future because Iraq's 32 million people basically all depend on water flowing from those two rivers. Control of water is seen as key to the viability of the fledgling caliphate declared by ISIS leader Abu Bakr al-Baghdadi. Without water, seasonal droughts cannot be managed, electricity cannot be generated, proper sanitation practices are near impossible and the local economy grinds to a virtual halt. "When it comes to creating an Islamic state, it is not just about the control of geographic areas in Syria and Iraq. In order to form a viable state, one must control the state's most vital infrastructure, which in Iraq's case is water and oil," said Matthew Machowski, a research fellow at Queen Mary University. fears abound that militants could employ a similar tactic at the Samarra barrage, overtaken recently in clashes around the contested holy city, the site of bloody sectarian violence in 2007. The barrage is designed to control the flow of water from the country's biggest lake, Tharthar, and generate hydroelectricity. With these key dams under its belt, ISIS appears to have turned its focus to Haditha, at the heart of Iraq's water infrastructure and responsible for 30 percent of the country's electricity, particularly to Baghdad. Positioned on a main artery to the capital, its capture would represent "a huge symbolic and practical victory," said Sticklor. Government troops are actively defending Haditha, alarmed that an ISIS victory there would pave a virtually clear the road to the capital. ... Haditha, along with Mosul dam, provides more than 75 percent of Iraq's electrical power. July 22, 2014 update: The predominantly Christian town of Qaraqosh, Iraq, population 50,000, lying about 20 miles southeast of Mosul faces an ISIS-enforced drought, reports Jason Motlagh. Under the protection of Kurds, Qaraqosh offers a rare refuge for Christians fleeing ISIS. But ISIS has turned off the water tap. Since taking Mosul on June 10, ISIL militants have squeezed Qaraqosh and nearby Christian villages by blocking the pipes that connect the communities with the Tigris river. Without a sufficient number of deep wells to fill the gap, the city must have water trucked in, at huge cost, from Kurdish-controlled areas just 15 miles away. Since ISIL took over key refineries in northern Iraq, the price of fuel has spiked across the region. The parched residents of Qaraqosh must pay about $10 every other day to fill up emergency water tanks, no small sum in this economically depressed part of Iraq. Outside one of the town's 12 churches, people queue from 6 a.m. until midnight to get their daily rations from a well. Flatbed trucks are joined by children with pushcarts and riders on bicycles bearing empty jugs. "Our lives revolve around water," says Laith, 28, a school teacher who returned with his family a day earlier from a suburb of Erbil, the Kurdish regional capital, 45 miles away, to which thousands of threatened Christians have migrated. Though aid agencies have erected several water depots around town, supplies are limited, barely enough to sustain large families in the 100-degree-plus heat. Plans to dig new wells will take at least several months to fulfill. Nor are Qaraqosh's problems limited to water: "electrical blackouts last most of the day. Merchants say business has been hamstrung further by a trade "embargo" that ISIL has placed on surrounding Muslim towns that used to trade with Qaraqosh." July 27, 2014 update: ISIS released the second issue of its slick Dabiq internet magazine in many languages, including English. 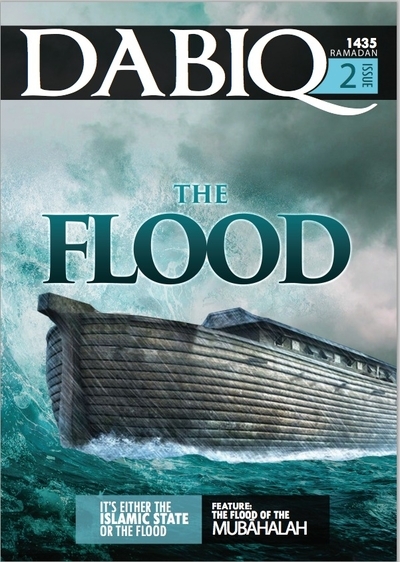 Ominously, the cover story shows a picture of something resembling Noah's ark on the waters and the headline "The Flood." Underneath comes the full title of the article in question, "It's Either the Islamic State or the Flood." The cover of "Dabiq,' second issue. In the article, by Abū 'Amr Al-Kinānī (note the very precise, scholarly transliteration), the Noah story is used to battle "the notion that the people can choose whether to follow the truth or to embark on falsehood." In other words, Noah's example shows the Muslims have no choice but to accept the ISIS interpretation of Islam. Comment: (1) According to the Bible, Noah's Ark was in today's Iraq. (2) Given the ISIS record of already having manipulated the Fallujah Dam a half year ago, and its proximity to the Mosul Dam now, the reference to a flood also has less metaphorical overtones as well. Islamic State fighters seized control of Iraq's biggest dam, an oilfield and three more towns on Sunday after inflicting their first major defeat on Kurdish forces since sweeping across much of northern Iraq in June. ... "The terrorist gangs of the Islamic State have taken control of Mosul Dam after the withdrawal of Kurdish forces without a fight," said Iraqi state television. Two people who live near Mosul Dam told Reuters Kurdish troops had loaded their vehicles with belongings including air conditioners and fled. Islamic State fighters attacked Zumar from three directions in pick-up trucks mounted with weapons, defeating Kurdish forces that had poured reinforcements into the town, witnesses said. Assuming this to be true, ISIS has three main options to make trouble: reduce or cut off water intermittently; permit flooding; or not maintain the dam, leading to its collapse. Fighting is raging near the Mosul dam, and it is a "no man's land," Sheikh Ahmed Al-Simmari, a resident of the nearby city of Rabia'ah, said in a phone interview. The Kurds have bolstered their forces around the area and are preparing a counteroffensive to retake the Rabia'ah border post with Syria and nearby towns, he said. ... The dam is functioning normally and is still under government control, Abdul-Jaleel Sahib, deputy director general of the state-run Commission for Dams, said in a phone interview. Kurdish Peshmerga are protecting the dam, Sahib said. Abdul Khaliq al-Dabbagh, director of the Mosul Dam, refuted reports Monday that the dam had been seized by the Islamic State of Iraq and Syria. Dabbagh instead hailed the Kurdish Peshmerga forces for successfully repelling the weekend assault. 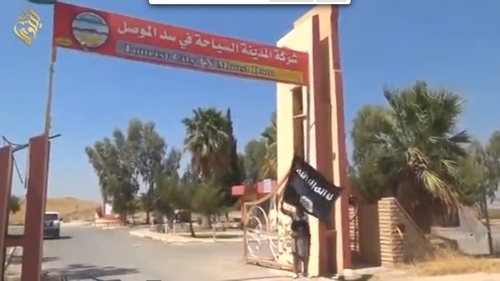 ISIS temporarily gained control of an employee housing complex at the dam, but were pushed back by the Peshmerga. A Kurdish Peshmerga colonel reportedly gave an erroneous account of the ISIS seizure to CNN on Sunday. Comment: For the moment, this sounds authoritative and I conclude that ISIS, fortunately, has not taken the dam. The Islamic State group posted a statement online Thursday, confirming that they had taken control of the dam and vowed to continue "the march in all directions," adding that it will not "give up the great Caliphate project." The group added that it has seized a total of 17 cities, towns and targets - including the dam - over the past five days. The statement could not be verified but it was posted on a site frequently used by the group. Halgurd Hekmat, a spokesman for the Peshmerga, told The Associated Press that clashes around the dam are ongoing and he does not know who is in control at this point in time. Also, Reuters reports that two witnesses told it "by telephone that Islamic State fighters had hoisted the group's black flag over the dam." In contrast, the Kurdish media site eKurd reports that Kurdish forces completely control the Mosul Dam after repelling ISIS: "Daash [ISIS] launched an attack on Mosul Dam but the Peshmerga repelled it," spokesman Halgurd Hekmat said. "They left at least one body and four destroyed humvees behind in their retreat." The Kurdish security sources say they killed the ISIS "minister of war," Tarkhan Batirhvili aka Abu Omar al-Shishani at the Mosul Dam. 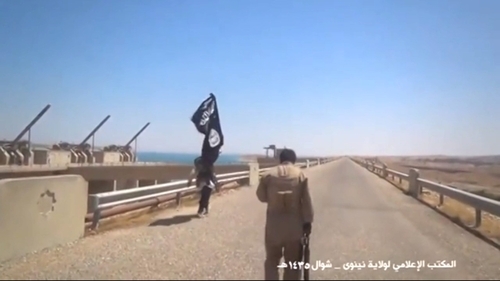 Comment: Reuters and Associated Press say ISIS took the dam, Bloomberg and UPI said it did not. Whom to believe? "extraordinary engineering measures" – namely constant grouting operations—to fill in the holes and "maintain the structural integrity and operating capability of the dam," according to a U.S. Army Corps of Engineers (USACE) report from the same year. For 30 years—and through several periods of violent conflict—the Iraqi government has managed to keep the dam upright by continuously pumping in literally tons of grout like an industrial version of the little Dutch boy, as a geotechnical expert who worked on the dam put it. a U.S. government official long-familiar with the dam said it's an unsettling idea made more so by a litany of unanswered questions. ISIS may not want the dam to fail, considering it controls territory that would be flooded and could leverage their control over the water and power source, but the U.S. official said it would still be up to the jihadist group to keep the grouting going. "If ISIS does indeed have or gain control of the dam, will they listen to the dam engineers who have been working there for decades and who understand the need for constant grouting? ... And then this is the biggie: If they can't or don't want to grout, how long will the dam last?... And if it fails, will it be a catastrophic all-at-once failure or more of a slowly building uncontrolled release?" the official told ABC News. "The short answer is no one knows. This is all guesswork anyway." The official said that he is not aware of official U.S. calculations about how long the dam would last without grouting but says he understands it to be "on the order of weeks, not months." The geotechnical expert agreed that "weeks" was a skeptical, but entirely possible estimation. "The potential for a disaster can't be ruled out and should be of great concern to all parties involved," the U.S. official said. The U.S. State Department told ABC News late Wednesday the department is "monitoring the situation closely." Officials at the Pentagon did not immediately respond to questions about whether any contingency plans are in place in case ISIS does take over the dam. Aug. 9, 2014 updates: (1) Reuters quotes witnesses saying that ISIS not only controls the Mosul Dam but has taken over the repair works, even bringing in its own engineers to conduct grouting. An engineer at Mosul dam told Reuters that Islamic State fighters had brought in engineers to repair an emergency power line to the city, Iraq's biggest in the north, that had been cut off four days ago, causing power outages and water shortages. "They are gathering people to work at the dam," he said. A dam administrator said that militants were putting up the trademark Islamic State black flags and patrolling with flatbed trucks mounted with machine guns to protect the facility they seized from Kurdish forces earlier this week. Comment: The specificity of this report does suggest that ISIS controls the dam, ending a week's uncertainty. A sign saying "Tourist City at Mosul Dam" in Arabic and English; the bug at the top left says "Ninevah," the name of the province. The dam itself with the "Ninevah" bug in the top left. 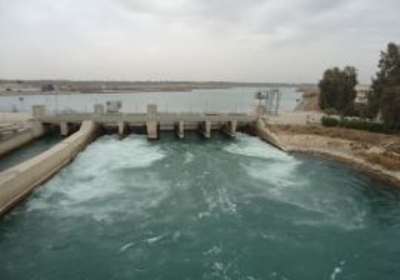 Earlier this month, IS militants reportedly closed eight of the Fallujah dam's 10 lock gates that control the river flow, flooding land up the Euphrates river and reducing water levels in Iraq's southern provinces, through which the river flows. Many families were forced from their homes and troops were prevented from deploying, Iraqi security officials said. Reports say the militants have now re-opened five of the dam's gates to relieve some pressure, fearing their strategy might backfire if their stronghold of Fallujah flooded. A week after taking over the Mosul dam, militants have reportedly been blackmailing frightened workers to either keep the facility going or lose their pay. Analysts fear the Islamic State could now use the dam as leverage against the new Abadi government, by holding on to the territory around it in return for continued water and power supply. Aug. 16, 2014 update: U.S. forces used jet fighters and armed drones to conduct nine airstrikes against ISIS yesterday at 5 p.m. local time with the apparent goal of seizing the Mosul Dam. According to Central Command, they destroyed or damaged 7 armed vehicles, 4 armored personnel carriers, 2 Humvees, and an armored vehicle. The American assaults hit 10 armed vehicles, seven Humvees, two armored personnel carriers and one checkpoint belonging to fighters of the Islamic State in Iraq and Syria, the United States Central Command said Sunday. Still, in Alqosh, at the military base where the operations to retake the dam originated, there was a decidedly optimistic attitude among the government fighters. Several offered to speak to reporters visiting the area, but only if they were not identified because they were not authorized to comment publicly. The soldiers boasted that the ISIS militants were retreating and spoke of an imminent victory at the dam as military vehicles passed in and out of the checkpoint area. Officials also spoke confidently about the re-energized pesh merga forces. "There is some fighting in different places in the area, but the pesh merga has moved easily forward," said Duraid Hikmat Tobia, a minority affairs adviser to the governor of Nineveh Province. "The problem is the mines — they cannot move quickly because they are afraid to hit them." "Still," he added, "I think tonight or tomorrow the Mosul Dam will be controlled by the pesh merga." On August 14, 2014, I authorized the U.S. Armed Forces to conduct targeted air strikes to support operations by Iraqi forces to recapture the Mosul Dam. These military operations will be limited in their scope and duration as necessary to support the Iraqi forces in their efforts to retake and establish control of this critical infrastructure site, as part of their ongoing campaign against the terrorist group the Islamic State of Iraq and the Levant (ISIL). The failure of the Mosul Dam could threaten the lives of large numbers of civilians, endanger U.S. personnel and facilities, including the U.S. Embassy in Baghdad, and prevent the Iraqi government from providing critical services to the Iraqi populace. Pursuant to this authorization, on the evening of August 15, 2014, U.S. military forces commenced targeted airstrike operations in Iraq. Comment: (1) The White House acknowledges, all these years later, the danger that the Mosul Dam poses. (2) Shoddy but not suprising that Obama would focus on the U.S. embassy personnel to justify this major step. 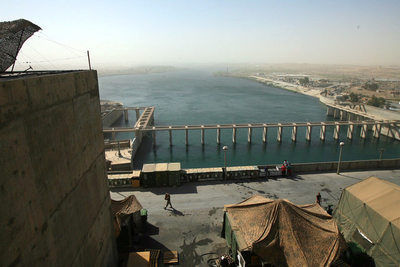 Aug. 18, 2014 update: Obama announced the re-taking of Mosul Dam. 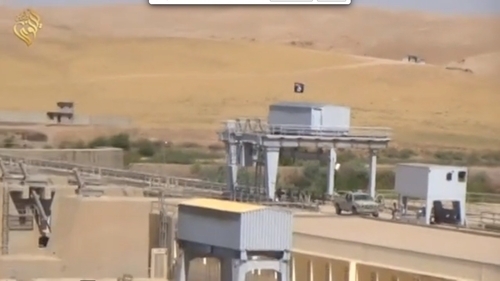 The Kurds forces also announced full control of the dam and its surrounding facilities. In contrast, the Iraqi government only claimed to have "liberated a large part" of the dam, not the entire complex. Dec. 20, 2014 update: An Iraqi member of parliament from Diyala Province, Furat al-Timimi, told Al Sumaria News that a "humanitarian disaster" could soon occur due to ISIS having diverted the Roz River away from Bildoz district in his province. ISIS, for the fourth consecutive day, diverted Al-Roz River, considered to be an essential water source to Bildoz, and supplying drinking water to 150,000 people as well as irrigating vast areas of land, ... thousands of people in Bildoz and other adjacent areas will be affected if water is not returned to its previous course into the river. June 4, 2015 update: ISIS has, after capturing Ramadi, the capital of Iraq's Anbar province, reduced the water flow to government-held areas of that province by closing the locks on a dam on the Euphrates River near Ramadi. In addition to depriving its enemies of water, ISIS thereby threatens irrigation systems and water treatment plants and also improves its military position by making the riverbed dry and crossable anywhere. Dec. 4, 2017 update: There's yet another Iraqi dam to worry about: the Darbandikhan Dam, southeast of Sulaimaniyah, has been damanged as a result of an earthquake on Nov. 12.